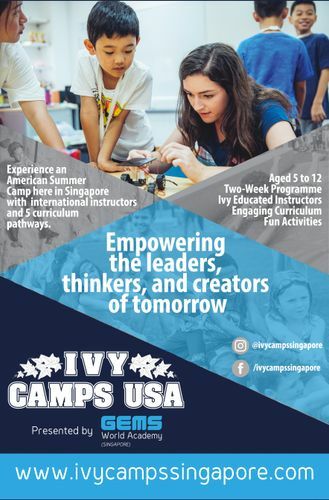 Ivy Camps USA is coming to Singapore this Summer. Our camp is lead by international instructors, from the top American universities and our curriculum is created by advisors including a Hollywood producer, scientist, engineer and entrepreneurs to give our campers (Age 5–12) access to innovative educational experiences and fun activities during our 2-week based programmes, Monday to Friday. Join us this Summer. Find out more at the website.